Are you planning a vacation to Niagara Falls Ontario Canada? Ideal Guests are travellers coming to Niagara Falls for a getaway/vacation/business who are looking for an alternative to expensive hotels, paid parking and are required to eat out for all meals. If this sounds like something you are looking for welcome to Vacation Homes Niagara! Vacation Homes Niagara offers travellers an alternative accommodation at the Fallsview Family Vacation Home. 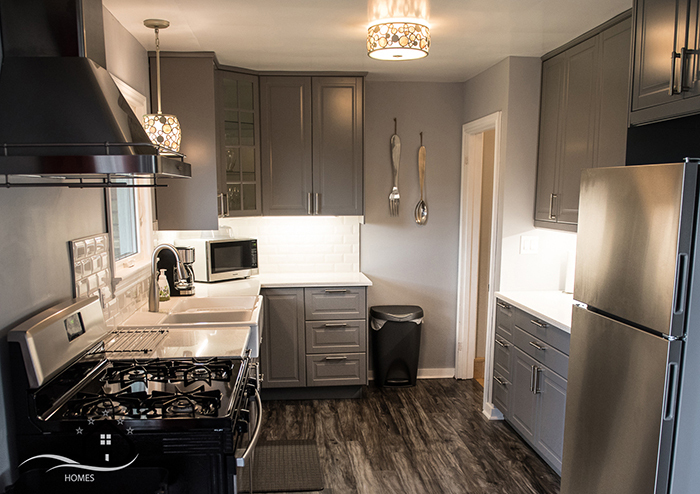 A fully remodelled vacation rental family home in the heart of the Niagara Falls tourist district. 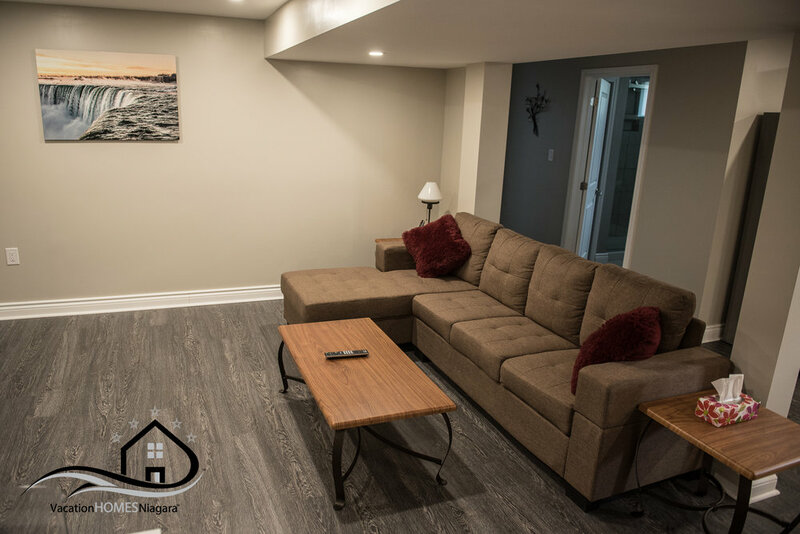 This home can be rented for short term rentals in Niagara Falls, from a minimum of two nights and up. 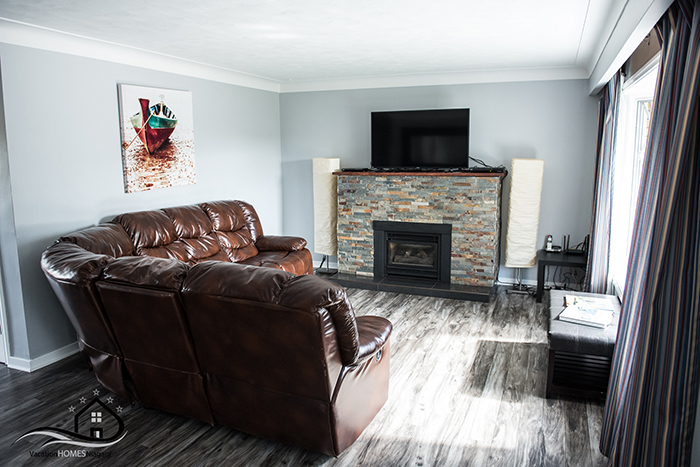 This lodging alternative is located on a quiet cull de sac, backing onto a brand new vineyard, and a short walk to the tourist district, the Fallsview Family Vacation Home can sleep up to 10 guests. This is ideal for large groups or families travelling together and eliminates the need to rent 3 or more hotel rooms per night, it also provides plenty of living space both inside and outside to enjoy time spent together instead of being spread out on alternative floors of a hotel with little to none common areas. The dining room has seating for up to 10, with additional chairs located downstairs, making breakfast, lunch and dinner easy and affordable, especially those travelling with dietary restrictions. This five bedroom family home consists of three bedrooms upstairs ( bedroom one has one queen bed, bedroom two has one queen bed, bedroom three has two single beds), and two bedrooms downstairs (both queen beds). 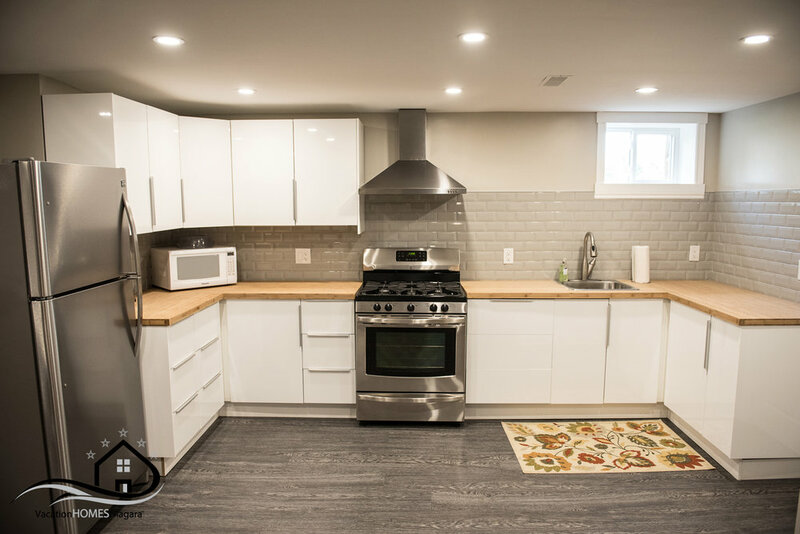 Additionally there is a fully equipped modern kitchen upstairs and one downstairs with a large living room on each floor, the upstairs living room has a modern comfortable fireplace. 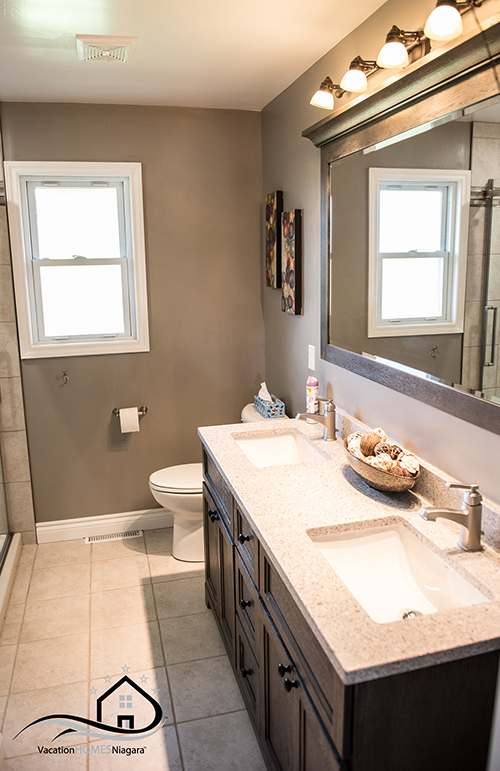 Two large bathrooms complete with walk in showers and double sinks further complement this home. 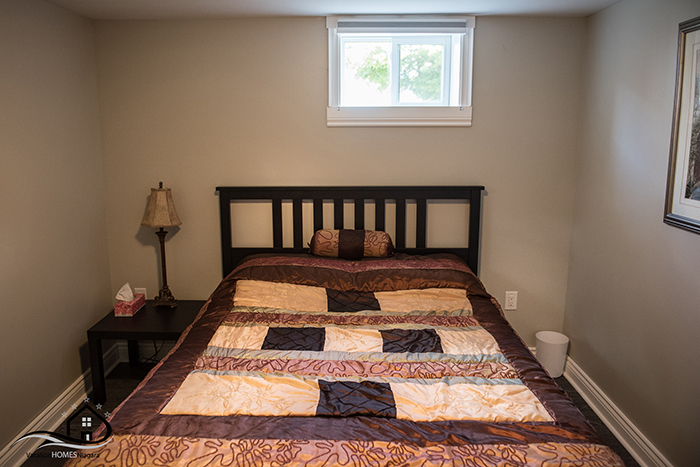 Before your arrival the home will also be professional cleaned with clean bed linens and towels for your stay. 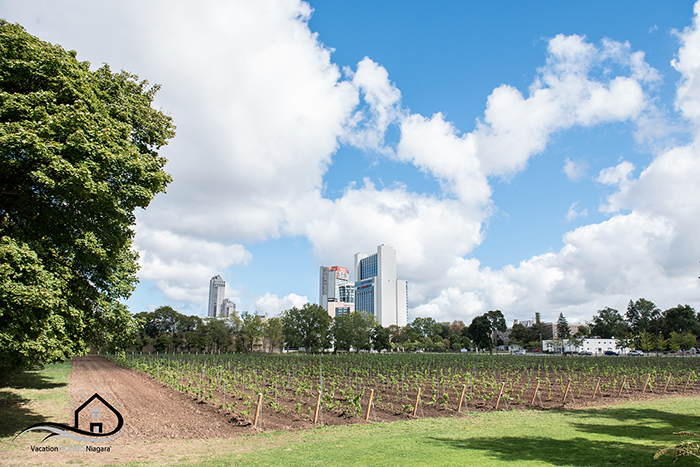 In the warmer months enjoy the fully enclosed deck that overlooks the vineyard and the skyline of Niagara Falls. The deck is furnished in comfortable outdoor furniture and a year round natural gas BBQ is available, no need to worry about bringing a propane tank or finding a spot to fill it up. Additional amenities include unlimited wi-fi, high chair and pack and play and free parking for up to 4 cars. Unfortunately this is a pet free home.